ESL kids Easter lesson ideas. Download a new song from ESL KidStuff: The Easter Song! Target Vocab: Easter rabbit, hiding, chocolate eggs, Look in the ~, garden, living room, kitchen, bedroom, dining room, bathroom, everywhere, I’ve found my chocolate eggs, yummy! A really fun Easter song with about searching for Easter eggs! Free Easter Lesson Plan to use in your ESL kids lessons! It is a fully tested, fun and educational lesson with lots of good vocab, crafts and exciting games. It is also available as a printable PDF file. We hope it is useful for you – please let us know in the comments box below and on the Easter lesson plan page. There are loads great activities you can do in your lessons in the lead up to Easter. 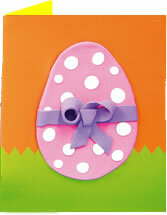 On ESL KidStuff we have a lot of Easter games & activities, Easter themed flashcards and worksheets. 1. Easter egg cards. You can easily make these in class with some construction paper, felt and common craft supplies. Before class, cut out enough card for each student for the actual card. Also, cut out the green grass for each student and different colored oval shapes for the eggs. Finally, cut out strips of felt for the ribbons and small circles to stick on the eggs. In class, have your students glue the felt onto the cards. Older kids can write an Easter message inside the card and for smaller kids you can help them write their own message (even get them to trace over a message written lightly in pencil). A nice idea is to have each student give their card to another student (in an envelope if you can stretch your budget far enough! ).